Posts Tagged "The Clowness at the Moulin Rouge"
Home » Posts Tagged "The Clowness at the Moulin Rouge"
This is Henri de Toulouse-Lautrec’s La Clownesse au Moulin Rouge (The Clowness at the Moulin Rouge) 1897. 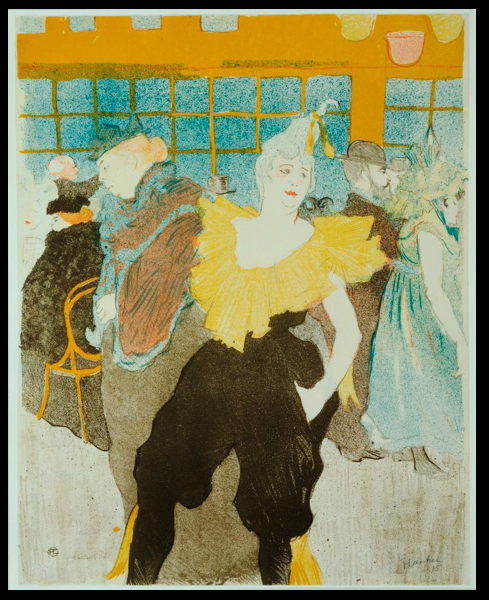 The Lithograph will be one of the many Lautrec Lithos and Posters at the MoMA exhibition in NY from July 26 to March 1, 2015. Scroll down Helen’s Blog for more. Stay tuned for the fashion and hair worlds interpretations and inspirations of the Belle Epoque era (which includes Art Nouveau) and Paris of the late 19th Century. Not much is known about the Clowness whose knickname was Cha-U-Kao, which came from an acrobat dance similar to the cancan and “chaos” which came from the uproar when she was dancing at the famous Moulin Rouge. The costume she wore could be fashionable today. And we love the hair tied way up there in a yellow ribbon.